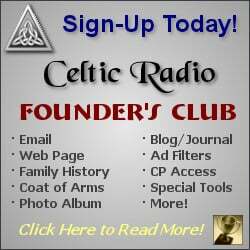 April 5, 2009 - CelticRadio.net - Kennedy's Kitchen plays tear-up-the-floor, break-your-heart beautiful Irish music; traditional dance tunes, pub and original songs, stories, jokes, and well embellished tall tales. They have has played from New York City to Chicago, from the Majestic Theatre in Gettysburg, to the Irish festivals of Dayton Ohio and Muskegon Michigan, entertaining audiences with their own special sound on: fiddle, whistles, banjo, bouzouki, guitars, bodhran, harmonica and bass. It's the ancient tradition and it's as fresh as a spring rain. Based in South Bend, Indian, Kennedy's Kitchen has grown over ten years out of weekly seisuns at Lula's Cafe in South Bend, Indiana. As a seisun is as much a social gathering as a musical one, so like their performances, the music is intermingled with stories, jokes and well embellished tales. No two performances are the same. Out of their respect for each other's talents comes an abiding drive to share their enthusiasm for Irish music and culture with others. Rowdy and toe-tapping or sweet and sentimental, you'll have it all. Kennedy's Kitchen has played over 100 shows per year for the last five years. In 2009 the Kitchen played the Riviera Theatre in Three Rivers Michigan. In 2008, they played the Majestic Theater in Gettysburgh, The Ramsey Auditorium at Fermilab in Batavial IL, The Acorn Theater in 3 Oaks Michigan, and at Musikfest in Bethlehem PA. In 2006 they shared billing with Tommy Makem at the DeBartollo Performing Arts Center at the University of Notre Dame. They have played the DeBartolo center four times. Kennedy's Kitchen has performed for straight six years at LVD's Concert Hall in Goshen, IN and at the Carnegie Center for the Arts in Three Rivers Michigan. They also play annually at Michigan Irish Fest in Muskegon Michigan and at Chicago's Irish American Heritage Center's Annual Fest. In 2004 they performed at the Kranert Center for the Arts at the University of Illinois. Kennedy's Kitchen appeared in the Shaheen Music Series at Saint Mary College along with Dervish, Colcannon, and The Baltimore Consort. They have performed each of the last six years at LVD's Concert Series in Goshen Indiana, and at the Carnegie Center for the Arts in Three Rivers, Michigan. In addition, The Kitchen has played some of the region's premier venues for acoustic and folk music: The Front Porch in Valparaiso, LVD's in Goshen, Indiana, and Kraftbrau Brewery in Kalamazoo, Michigan. Kennedy's Kitchen has released four CDs. 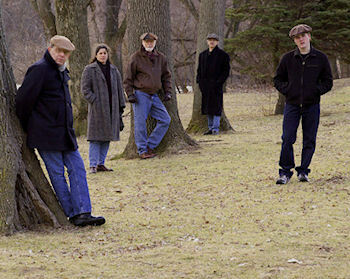 The band released their first CD, Kenndy's Kitchen, in July of 2003 amd selected by National Public Radio affiliate WVPE FM 881's The Back Porch as one of the top 25 folk releases of 2003.. Their second CD, a live recording, entitled Music in The Glen was released in September of 2004. Their third recording, A Pocketful of Lint was released in November of 2006. And in 2009 their fourth CD, The Hotting Fire. Another great album by Kennedy's Kitchen! "The Hotting Fire" is a collection of some of the best traditional Irish Music complimented by a very talented group of musicians. A nice mix of Jigs & Reels, Vocals and a wonderful story of joHn Kennedy's Grandmother from Donegal 1904 called "Crickets in the Hearth." The Hotting Fire is surely an album that will be treasured for years to come. 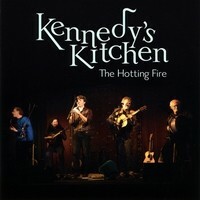 Five Golden Radio stars for Kennedy's Kitchen latest CD - "The Hotting Fire."